EDISON, NEW JERSEY (MARCH 31, 2010) — The new SANITOP — part of the recently unveiled “Quiet Range” lineup of upflush plumbing systems from Saniflo U.S.A. — is the smallest and quietest macerator on the market with a noise level nearly 10 decibels less than the older upflush toilet systems. Measuring only 13 inches wide, SANITOP can be used to create an additional half bathroom in residential spaces that lack below-floor drainage. SANITOP uses above-floor plumbing technology to handle waste from a rear-discharge-type toilet and a sink. 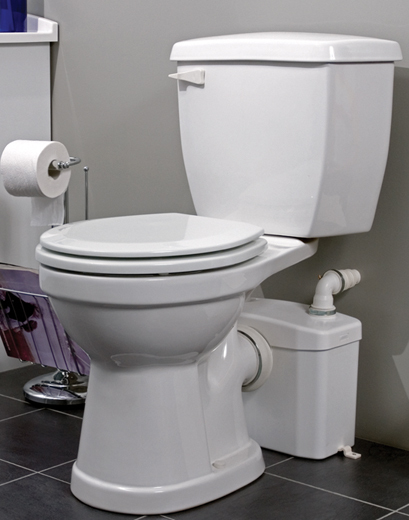 Instead of connecting conventionally through below-floor drainage lines to the sewer or septic tank, an upflush toilet system moves waste and toilet paper to a macerator, which employs a fast-rotating blade to reduce it. The system then pumps the slurry under high pressure through small-diameter piping that can be installed in front of or behind a wall. This permits the creation of a half bathroom atop any finished floor. Walls and floors remain intact, and installation is accomplished quickly and economically with minimal disturbance to room layout. The system can be fully operational in as little time as a half-day. 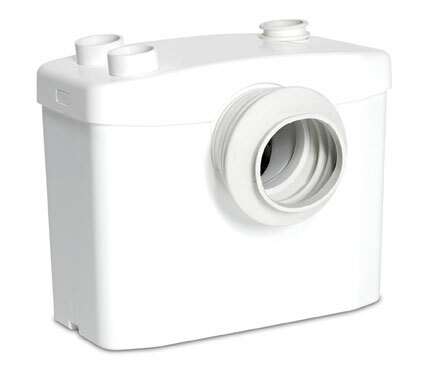 Available with a round or an ADA-compliant elongated bowl in white or with an elongated bowl in biscuit, the new SANITOP can pump 12 feet vertically and 120 feet horizontally to the sewer line or the septic tank. An 18-inch extension pipe is offered for installing the macerator unit behind the wall. A smaller, more powerful pump motor performs the macerating function more quickly, thus emitting less noise and vibration. Sound-absorbing “silent blocks,” made of rubber and strategically placed around the motor and at the base of the macerator, reduce the amount of vibration transmitted through the walls of the unit to outside surfaces, such as the floor on which it sits. Anti-vibration studs, positioned at the bottom of the macerator, lift the unit slightly above the floor, further reducing the transmission of vibrations to this surface. Certified to American and Canadian standards, the new SANITOP is CSA-certified and IAPMO (UPC)-listed and complies with its applicable standard: ASME A112.3.4 (U.S.A.) and CSA B45.9 (Canada). Saniflo warranties the SANITOP, including all electrical components, for 24 months. Images are 6" wide x 4" high x 300 ppi (1800 x 120 pixels); CMYK; unless otherwise specified. 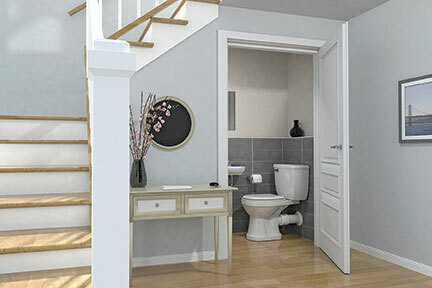 The new SANITOP uses above-floor plumbing technology to handle waste from a rear discharge-type toilet and a sink. The new SANITOP upflush macerating system, measuring only 13 inches wide, is ideal for creating a powder room (toilet and sink) in a small space.